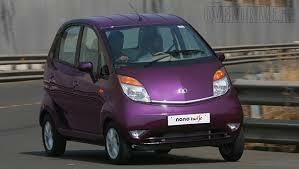 I recently read several critical safety reviews of small cars in Indian newspapers including the Tata Nano. The reviews show that these small cars do not adequately protect their occupants from harm in the event of a head-on collision at 60 kilometres per hour. There is no doubt that these tests are objectively carried out and the potential damage to life and limb is very real. 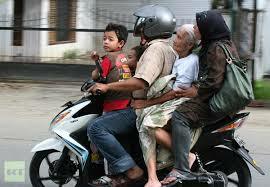 The base starting price of the Nano in 2014 is US$ 2,300. around twice that of several popular brands of motorcycles. Therefore the relevant safety question to be asked here is: who is the intended target buyer for the Nano? If this aspect is considered, the real question will be: how much increased security will a potential buyer experience in moving up from a motorbike to a Nano? The street scenes below will speak for themselves. 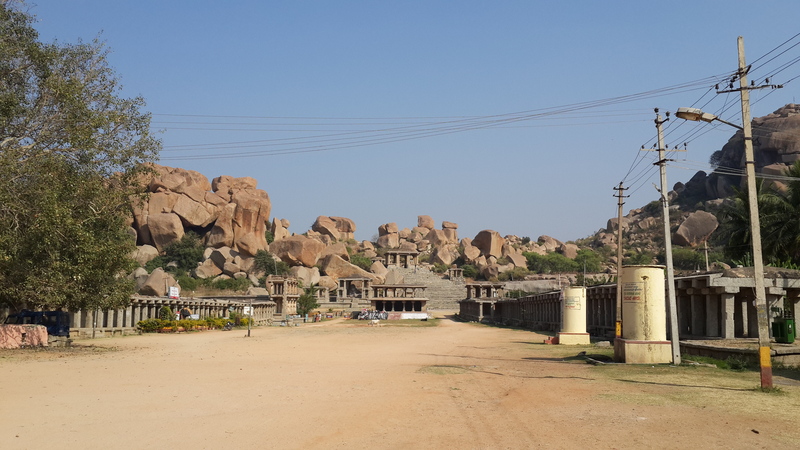 There are 4 cave temples on a rocky hill above the town, all carved out of the giant rocks that form the hillside. 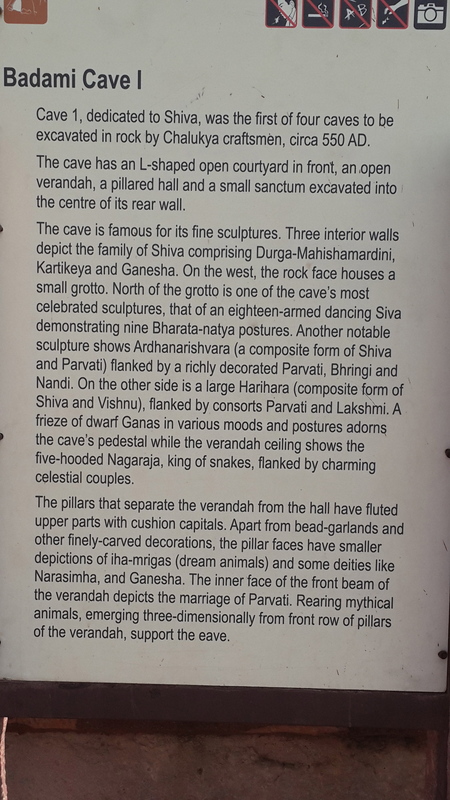 The first two caves are dedicated to Shiva, the third (and grandest) cave is dedicated to Vishnu. 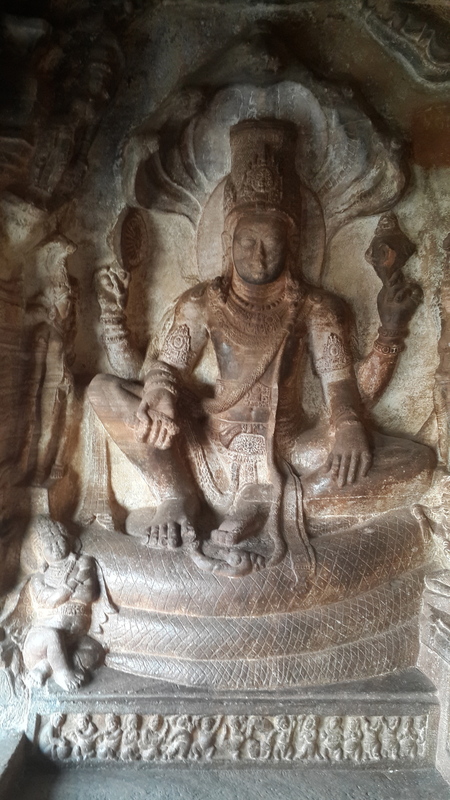 Shiva and Vishnu are the second and third members of the Brahmanical Trinity, the first being Brahma, who is traditionally accepted as the creator of the entire universe. 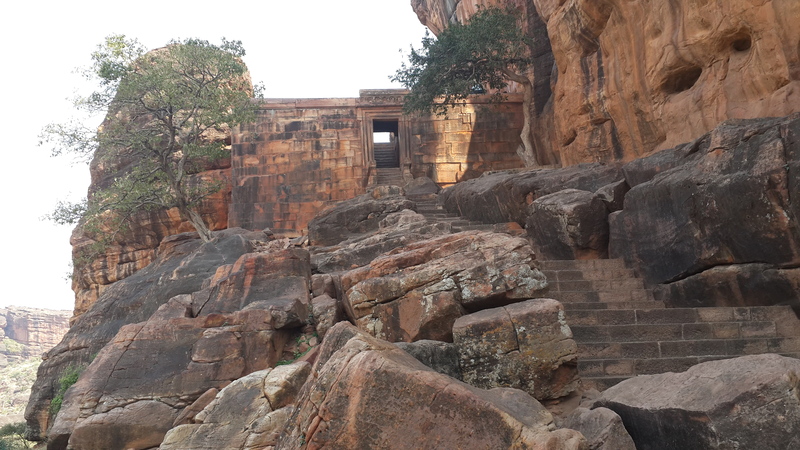 The fourth cave is a Jain temple, adorned with an image of Mahavira, the last of twenty-four teerthankaras, or spiritual role models in Jainism. Mahavira was born into a royal family around 540 BC somewhere in today’s Bihar state in India and he reputedly lived till around 468 BC. This makes him a contemporary of Gautama, the Buddha, who lived from around 563 to 483 BC according to the latest reckoning of historians and scholars. Further coincidences in their lives abound. They were both born into princely families. 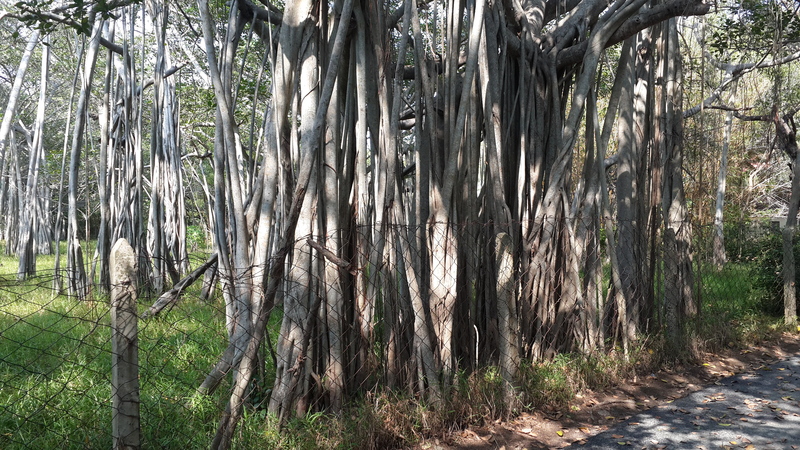 They both lived traditional family lives until they left their homes at the ages of 30 (Mahavira) and 29 (Gautama) and wandered in search of spiritual truths. 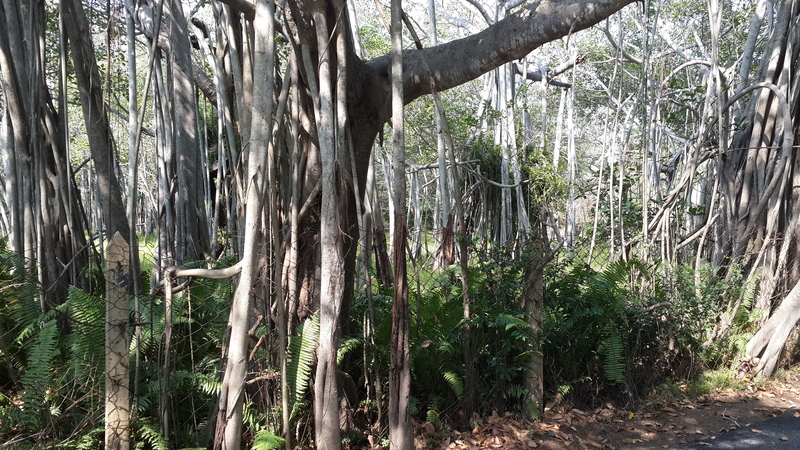 Interestingly, although Gautama was born in today’s Nepal, he reputedly achieved enlightenment while meditating under a pipal tree in Bodh Gaya, in Bihar, where Mahavira was born. 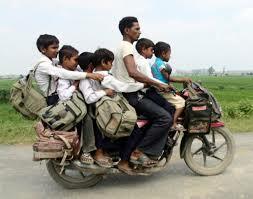 The present day state of Bihar is relatively poor, but was a great center of learning and spirituality at the time. One of the earliest universities in the world existed at Nalanda, from the 5th to the 11th century AD.and lies just 90 km from Bodh Gaya. 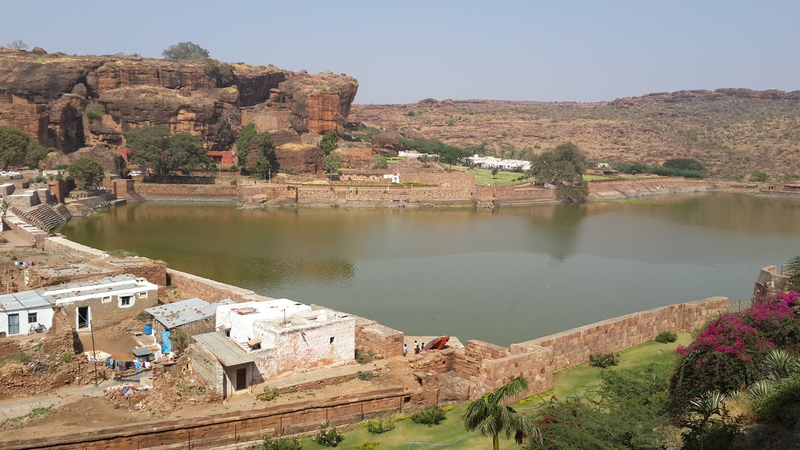 The Badami cave temples are in Karnataka state, not far from the scattered ruins of Vijayanagar in Hampi. 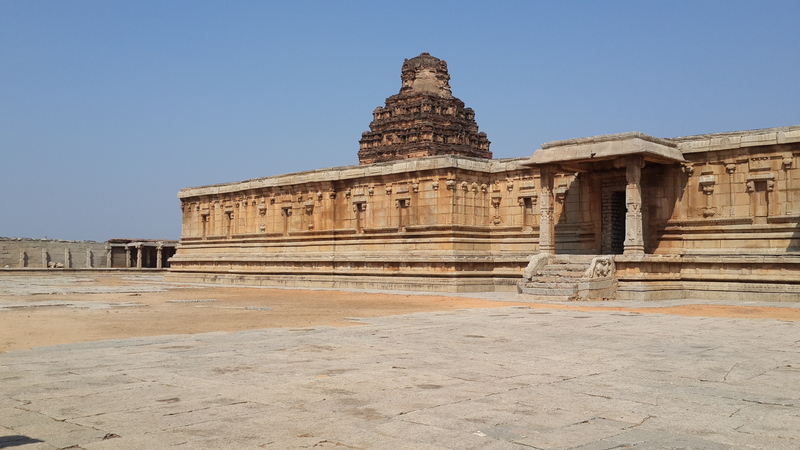 A city of well-preserved temples, palaces, elephant stables and elevated viewing points; the remains of a wealthy 14th-16th century empire scattered over 350 square kilometers of sparsely populated countryside; the vibrant Virupaksha temple, still being used and worshipped in by thousands every year. 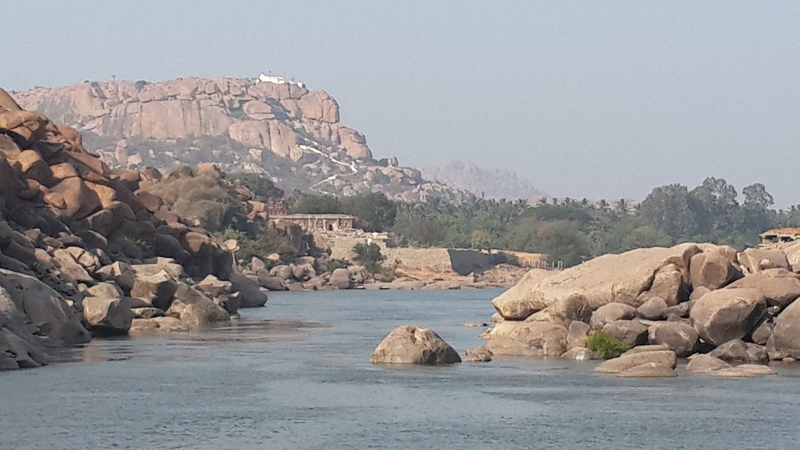 All this lies on the banks of the Tungabhadra river that flows, deceptively serene, nearby. Swimming in the still flowing waters is strongly discouraged by large signs that warn of treacherous whirlpools and undertows caused by the rocks in the water. The signs forget to mention a further disincentive, the occasional crocodile that floats sluggishly by. 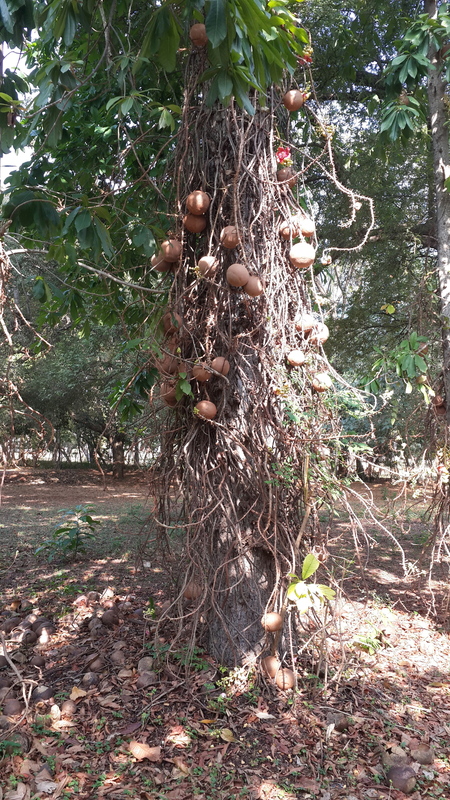 Domingo Paes was a Portuguese traveller who visited the Vijayanagara Empire around the year 1520. About the ports under the rule of Vijayanagara, Paes writes: “The said kingdom has many places on the coast of India; they are seaports with which we are at peace, and in some of them we have factories, namely, Amcola, Mirgeo, Honor, Batecalla, Mamgalor, Bracalor, and Bacanor. 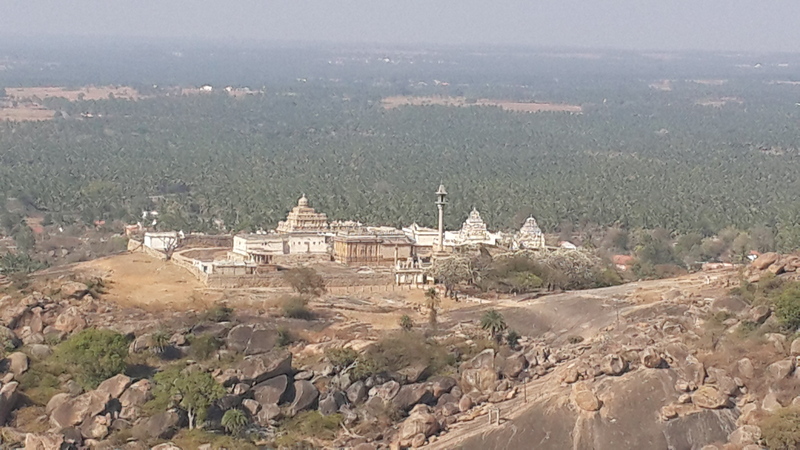 Hampi’s ruins are today a UNESCO World Heritage site and well worth a visit. It might be best to reserve 2 or 3 days for the visit, because of the extent of the site, the magic of the rocky landscape, and the many beautiful views along the river. 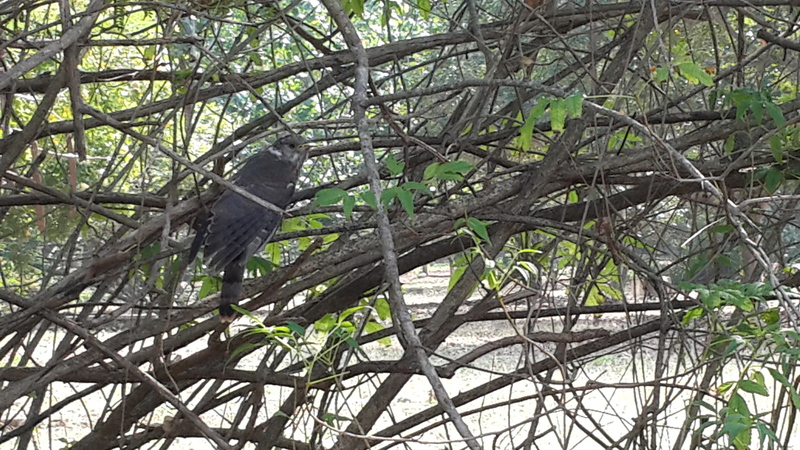 There is also a sloth bear sanctuary nearby. Coracles and small boats are available for tourists who wish to cross the river to see the ruins on the far side. Ask any mountain climber why they climb mountains and there is often a touch of the mystic in their replies. Although their replies might be couched in intellectual terms, or even though they might write whole books to explain why, the reason can often be condensed into a short sentence; to be closer to God; to feel an overwhelming sense of peace; to transcend the self for a brief moment,or; it’s simply out of this world. The impulse is an ancient one. 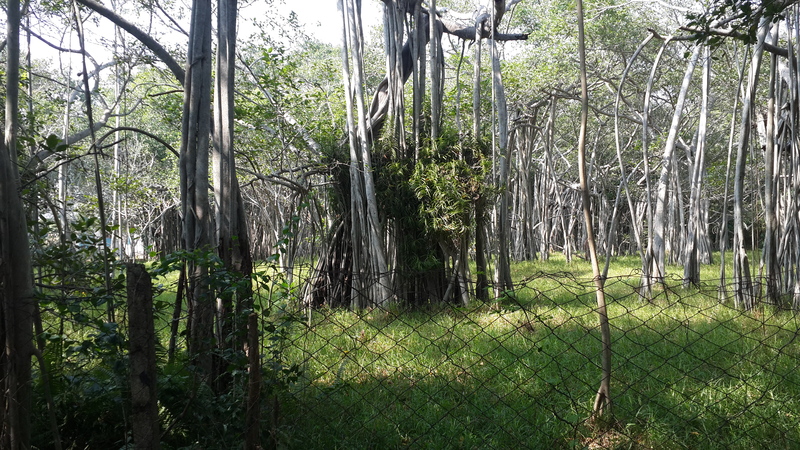 Emperor Chandragupta Maurya is said to have meditated here after abdicating the throne in 298 BC. 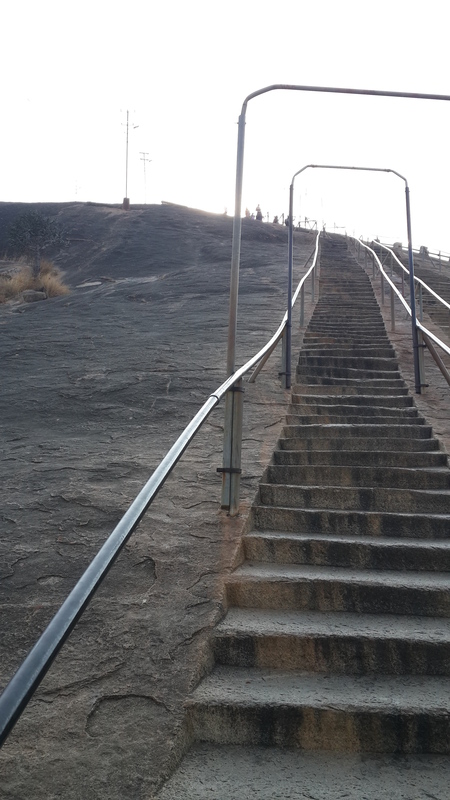 Sravanabelagola, the white pond of the Sravana (the colossal monolithic statue on the hilltop), is a site that exudes an undoubted sense of peace and sanctity, some of it induced no doubt by the need to rest after the strenuous climb to the top. Various inscriptions have been found at this site and are dated from 600 to 1800. 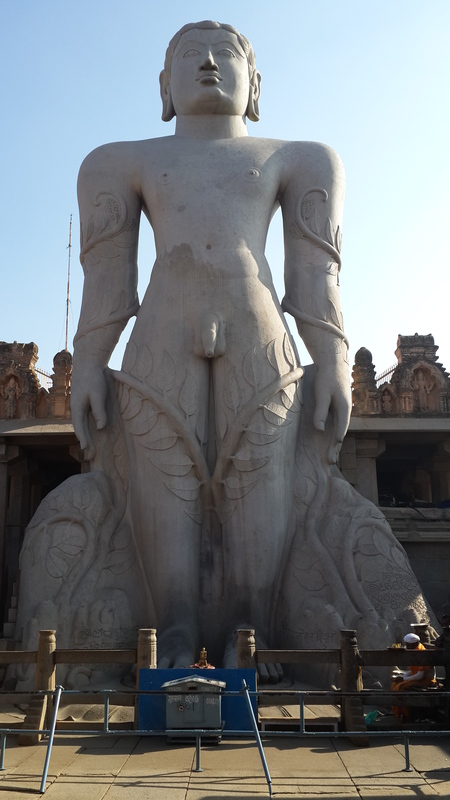 The statue itself was erected around 981 AD. 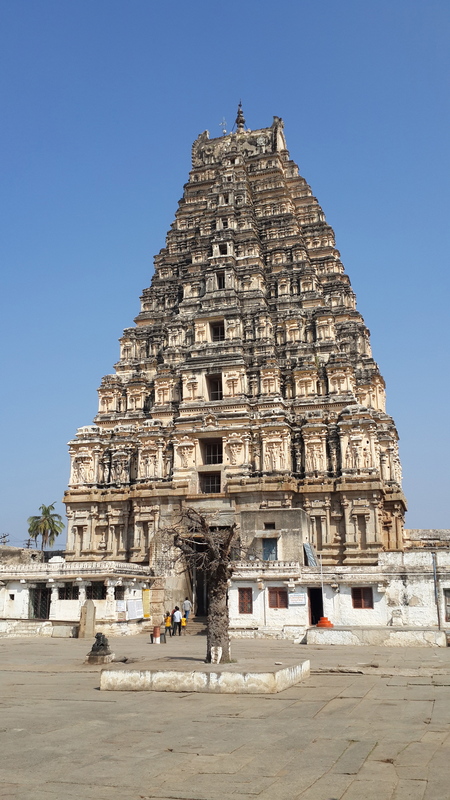 Some of these inscriptions attest to the rise and power of a succession of regional empires, including that of the Vijayanagar kings who ruled in nearby Hampi from around the 1300s to mid-1500s. 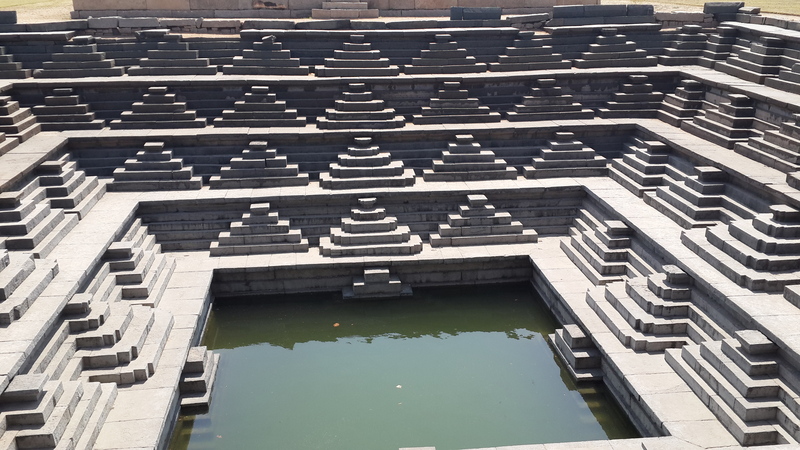 More about Hampi in the next post.